Entrepreneurs see the world in a different light, capitalizing on opportunity and balancing incredible risk with the chance of a massive reward. Stoll is the co-creator and founder of the COMPASS for Courage project and is a student in the Courage Lab, which is led by Armando Pina, associate professor of psychology. COMPASS for Courage is a social and emotional learning curriculum for elementary schools targeted to students struggling with anxiety or stress. The curriculum teaches students practical strategies to manage worries, build problem-solving skills, increase self-confidence and improve relationship-building skills. Stoll has been involved his entire life in creative endeavors, from designing logos, to wedding photography, videos and graphic design. The new challenge of delivering evidence-based programs to the community required the kind of creativity not often associated with academia but with the start-up world. The answer became very clear to Stoll: bring the start-up world to mental health intervention and education. Like many innovators, Stoll does it all: product design and development, market research, program evaluation and marketing. 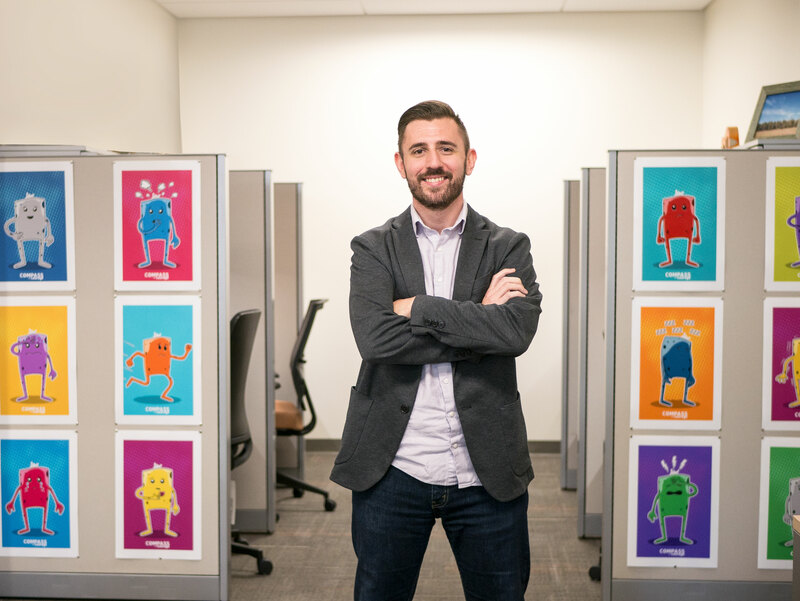 His nontraditional educational background — he started out as a photography major and worked at UPS in management — helped build a broad skill set and platform to launch his ideas, and all he needed was a spark. That spark came in the form of winning the ASU Changemaker challenge and both the Edson Student Entrepreneur Initiative and the Pakis Social Entrepreneurship Challenge at ASU’s Demo Day. These ASU-funded contests provided both the validation and resources needed to make his vision come to life. “My experiences with Demo Day and all the resources ASU has to offer for student entrepreneurs has really solidified the direction COMPASS is going and where I want to take my career,” Stoll said. Stoll found that pursuing a nontraditional route during graduate school was welcomed at ASU. He had complete support from his graduate mentors, the clinical psychology faculty and the psychology department while working on COMPASS for Courage. For Stoll, being an entrepreneur is more of a mindset change than anything else.